A few weeks ago my daughter found an abandoned book on the train - and when she read the title she just knew it was destined to be mine! I'd never come across the writer before but I'm totally impressed by her ingenuity - not only is it a crime story (big market!) but it's a crime story wrapped around KNITTERS! So she's cornering a niche market - well done Maggie Sefton! After visiting her website I discovered she's even more clever than I'd suspected. Not only does she write Knitting Yarns (sorry), she also has a series of Estate Agent stories. Whatever next? She obviously deserves a wider audience. Can I also recommend Little Kitty's Knitting Needles by the Revd PB Power - quite astonishing stuff! Thanks for 'Finding' me on Twitter. I love my UK friends! I look forward to following your blog ;-) Please come visit me when you have a free moment. 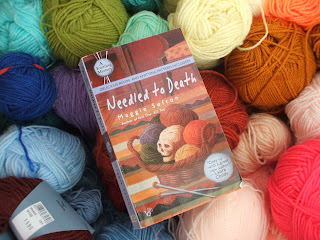 These knitting mysteries are delightful! I read "Knit One, Kill Two" and really enjoyed it. I'm in Dyer Consequences now and just haven't been able to sit down long enough to read! (I may have to see if I can find it on CD.) I want to know how it ends! Great! More people should capitalise on niche markets - whether for literature or otherwise. You often find a more appreciative/receptive group (especially when it's a niche you have a personal interest in) - though you may never make the 'big' bucks...! Brilliant idea. I'm off to find a copy.